The next two prints give very different views of domestic life. “Le Neuvieme Mois” or “The Ninth Month” by Louis-Léopold Boilly is an example of genre painting, which by definition depicts types of people rather than a particular person, generally in an unpretentious setting. 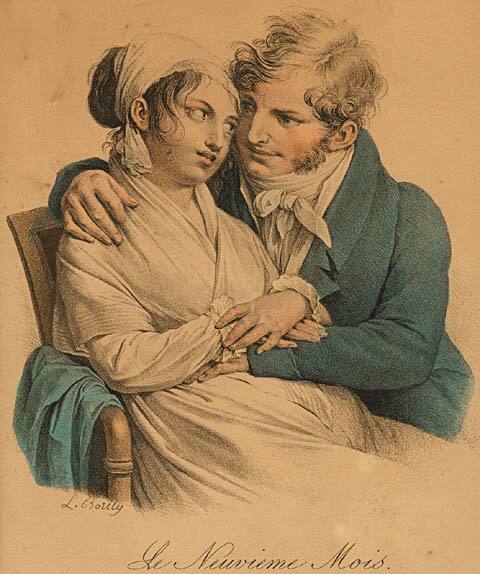 Boilly captures the sentiment of an expectant couple. The mother-to-be sits in a chair, and while the man’s lower body is not visible, it appears that he is kneeling beside her. The future father is attentive as he rests one arm on the woman’s abdomen and wraps another tenderly around her shoulder. Leaning towards each other, their eyes lock on the other’s face, to the exclusion of all else. Arrivez, arrivez, nourrice. _ Dieux comme y ressemble a Mosieu! Come, Come nurse. _ Good Good! what a likeness. Grandville, (Les Métamorphoses du Jour. No. 11. ), Lith. de Langlume, chez Bulla, rue St. Jacques No. 38. et chez Martinet, rue du Coq. 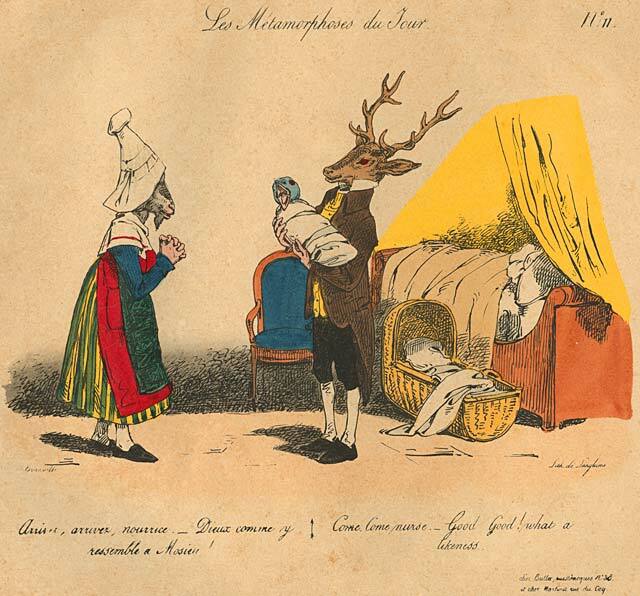 Boilly’s sweet, sentimental picture contrasts with Grandville’s satirical caricature, another scene from his “Les Métamorphoses du jour.” The father figure, characterized as a stag with prominent antlers, holds an infant with the head of a baby bird, its beak wide open. The father exclaims, “what a likeness,” as he prepares to hand the baby to the goat-headed nurse he has summoned. Early writing about infant feeding frequently gave advice about the selection of a suitable wet nurse, indicating this practice had been utilized by those with enough money to pay for it for many centuries. In eighteenth-century Europe, anti-wet nursing literature expressed concern for the well-being of the babies being farmed out, but not much consideration for the offspring of the wet nurses who were often neglected or even permitted to die to make way for a paying consumer. Despite exposure to these anti-wet nursing pamphlets, the French employed more wet nurses in the nineteenth century than any other country, and the practice was common in all but the very lowest socioeconomic class.24 In the countryside a wet nurse would free up an able-bodied woman to work in the field. In the cities a woman working in a factory could not take time off or bring a baby to work so was forced to choose between either hiring a wet nurse or abandoning the child. A wet nurse preferred employment with an aristocratic or bourgeois family, such as Grandville illustrates, because working conditions were more pleasant and the pay was greater. Because of the high rate of infant abandonment and the state’s assumption of responsibility to care for foundlings, French institutions experimented with alternate methods of feeding infants. If there were not enough wet nurses to feed the hospice babies, animals’ milk, generally cow’s or goat’s, was used.27 An image from 1816 in London’s Wellcome Institute Library shows two women holding an infant who is nursing directly from a goat. This method was utilized when the supply of wet nurses was inadequate, and also to feed syphilitic children.28 Grandville’s choice of a goat’s head for his nurse is as fitting as his selection of a bird’s head for the baby. The stag father’s comment, “what a likeness,” refers to both the nurse and the baby!